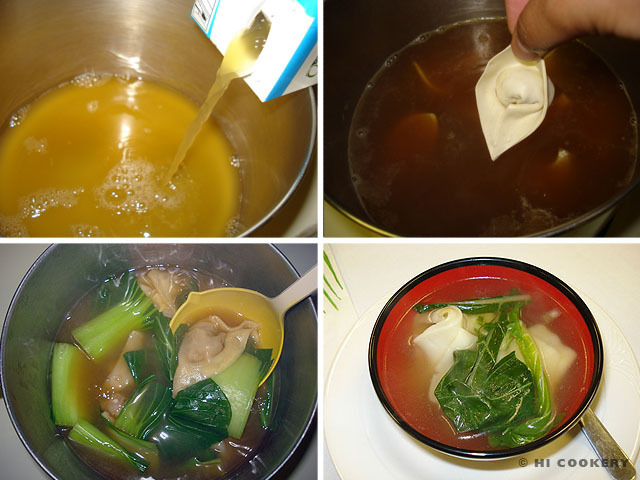 Have a ton of fun by cooking crispy won tons or boiling them in a broth. 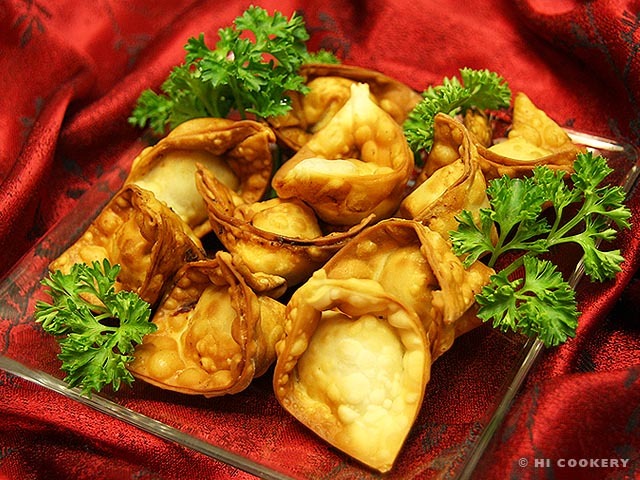 For our new year’s festivities, we frequently feature fried won tons as an appetizer. For cold weather comfort food, we savor the soup. We doubled up on this delightful dumpling recipe post for our blog to wish our readers both a Happy New Year and Happy National Soup Month! Dice the water chestnuts finely. Grate the carrot. 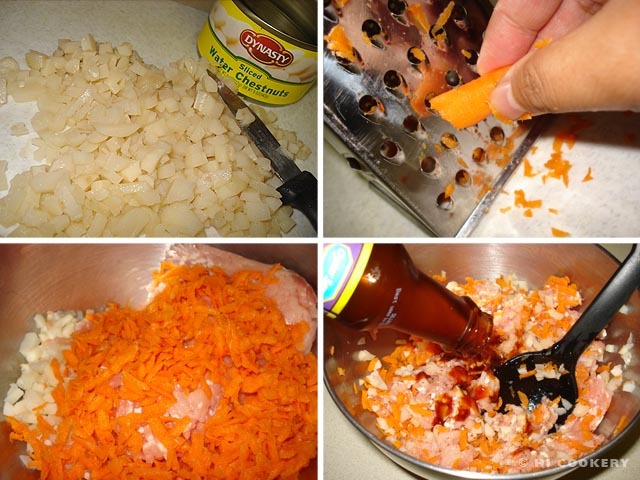 In a mixing bowl, combine the ground pork with the diced water chestnuts and grated carrot. Season with black pepper, garlic powder and oyster sauce. 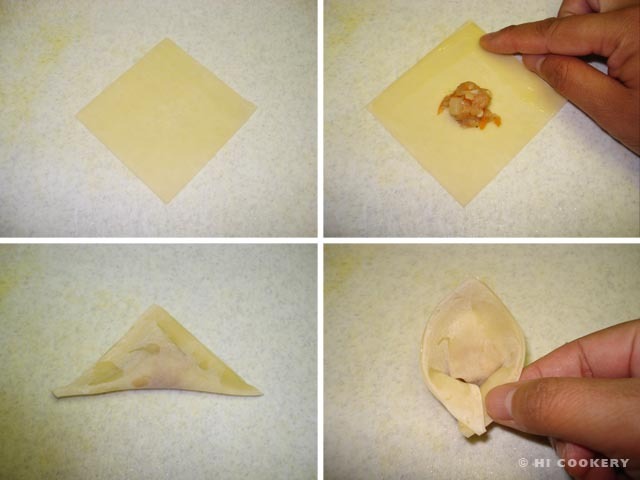 With a won ton pi point down, place a heaping teaspoon of filling in the middle. Moisten the top edges with the egg wash. Press upwards to seal the triangle. 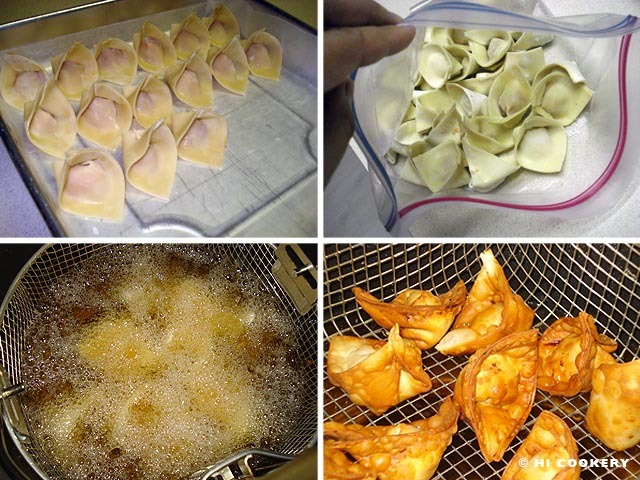 Join the bottom points together, sealing with the egg wash.
Place each won ton in a tray lined with waxed paper. Freeze until firm. Transfer to a zipper-top plastic bag until ready to cook. For crispy appetizers, heat the oil and fry the frozen won tons in small batches until golden brown. Be careful not to splatter the hot oil while fyring them. Drain on paper towels. Serve with a favorite dipping sauce. For a hearty soup, do not fry the won tons. Instead, boil the chicken broth in a large pot. Mix in the soy sauce, sherry and sesame oil. Add frozen won tons and lower the heat to simmer for about 5-10 minutes or until the filling is cooked through. For the last few minutes of cooking, add the boy choy leaves. Ladle into soup bowls and serve hot. February 4 is National Homemade Soup Day.